Budapest is one of the biggest and most exciting cities in Central and Eastern Europe. Amongst its most popular attractions are undoubtedly its thermal baths, now renowned throughout the world. Although Budapest, the capital city of Hungary, has only officially carried the title as a Spa City for 80 years, its unique facilities were fully recognized by Roman legio-naries over 2000 years ago! According to available records, there were then 14 baths in the city at that time, some of whose remaining foundations and walls can be seen in Óbuda to this day. Most of the baths open today were established by the Turks, examples of which, the Rudas and the Király Baths, are still in operation after five hundred years. At that period in history, our city was called the Mecca of Rheumatics due to the salutary effects of its thermal waters. The waters are also effective in healing locomotor, circulatory diseases and womens’ health problems. Open-air baths - built mainly on the outskirts of the city to complement the thermal baths located mainly within the city center - have been popular with the inhabitants of Budapest since the 1920’s. Unmatched even on a world scale, the daily delivery of 70 million litres of 21-78 oC thermal waters, gushing out of 123 natural hot springs and drilled wells, means that Budapest can proudly proclaim itself as the capital city of healing and thermal waters. 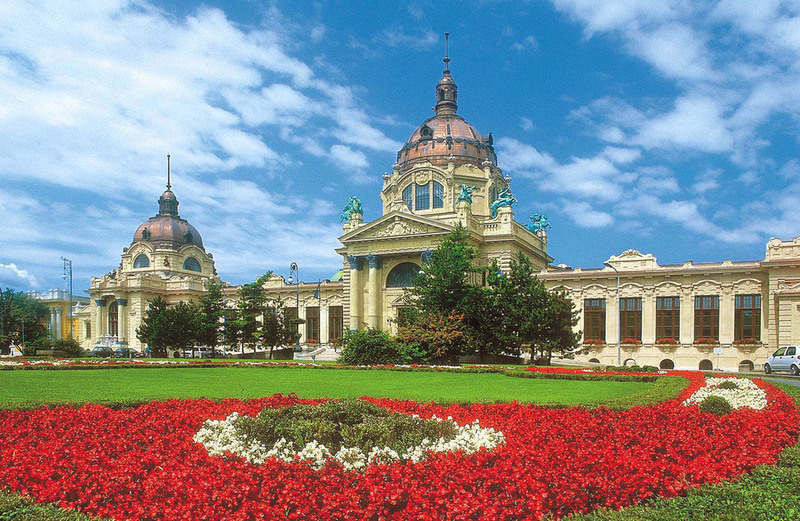 The Széchenyi Thermal Baths, built at the beginning of the 20th century and the first healing baths in Pest, is the biggest bathing complex in both Budapest and Europe. It is also very reminiscient of the Roman, Greek and Eastern styles of bathing. Those who seek recovery from illness by bathing in the healing waters; or prefer to bask in the hot rays of the sun; or just simply while away the time in a stunning, captivating atmosphere will find a perfect solution here in Budapest. If water sports are your thing, then you too will be completely satisfied with the facilities the city has to offer.